Northern Botswana is renowned for its wilderness areas, places such as the Okavango, Chobe, Linyanti and Savuti, places where wildlife finds refuge from the ravages of abuse in the neighbouring territories but at the heart of the northern wilderness is the Okavango Delta. What is not generally known is that all these waterways are bound by a chord that once connected them all in one unique eco-system. Today they seem to exist as wilderness areas independent of each other - but on closer inspection the unique binding feature is evident. Once part of the same system, the signs of their singular past seen from the air in patterns created in the earth, the areas now move to their own rhythms. An umbilical cord, parts of which are writing their own lyrics, attaches all the components. Still visible, and in some places withered and long since used, it is part of the drama of the greater whole. 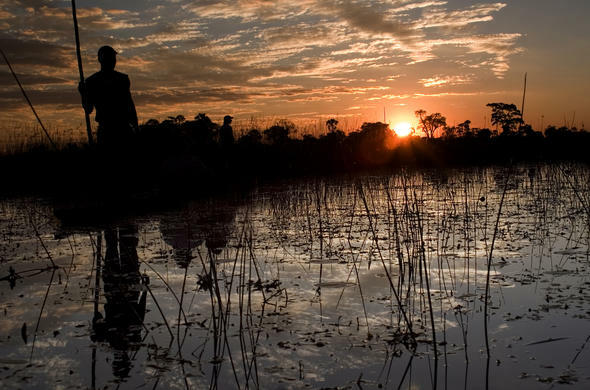 At the heart of this incredible system is the Okavango Delta. Surrounded by the sands of the Kalahari Desert the delta provides some of the parts with the lifeblood that is water. Past eras of this wilderness are seen in patterns as ancient floodplains and long-dry rivers, inscriptions in the desolate wilderness. Today the Okavango still overflows by way of the Khwai River towards the Mababe Depression, providing a drama of extremes on route. The flow of the Khwai has not reached the Mababe for a long time, withering to dust and drama before reaching the now mystical place. The Mababe embraces the Savuti Marsh that is fed by the channel flowing from the Linyanti system. The marsh, dry for more than a quarter of a century, is now in flood providing an Eden for countless wildlife. 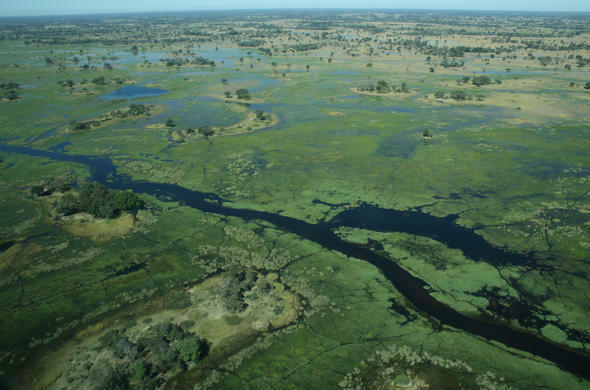 The Okavango is connected to the Linyanti system by route of the Selinda Spillway. At times the spillway is a provider echoing its past, with water flowing in either direction depending on the rains, but mostly now it is a withered sandy streak stretching across the vast space.